Deborah Prescott | Daily Press Eighth grade students from Bark River-Harris take turns listening to a heartbeat in the Nursing-SIM Lab at Bay de Noc Community College, Friday, Feb. 15. Bark River-Harris and Mid Peninsula eighth graders were at Bay and the DSISD for a program called the 8th Grade Career Exploration, hosted by the Delta County College Access Network. 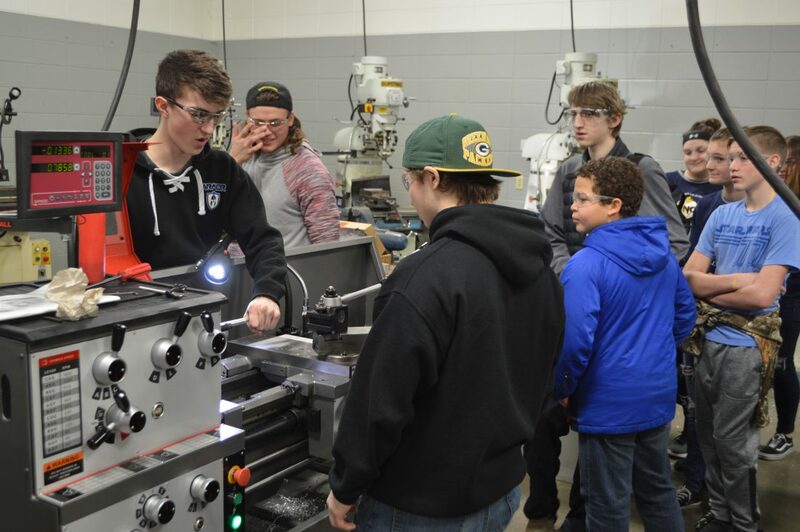 Deborah Prescott | Daily Press Bark River-Harris eighth graders view the operation of machinery by currently enrolled students in the machining technology class at the Delta-Schoolcraft ISD. The students joined Mid Peninsula eighth graders Friday, Feb. 15, for the 8th Grade Career Exploration program held at the DSISD and Bay College. 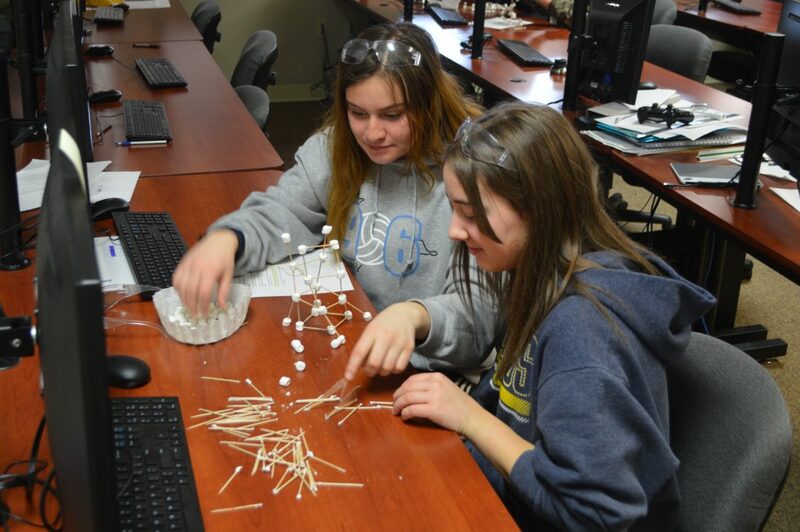 Deborah Prescott | Daily Press Students from Bark River-Harris create a tower with mini marshmallows and toothpicks in the product development and design classroom at the Delta-Schoolcraft ISD. ESCANABA — Eighth grade students from Bark River-Harris and Mid Peninsula school districts visited the Delta-Schoolcraft Intermediate School (DSISD) and Bay College, Friday, Feb. 15, in Escanaba. They attended the 8th Grade Career Exploration program, hosted by Delta County College Access Network (DCCAN), to hear about opportunities that will be provided during high school. “The 8th Grade Career Exploration project provides more information to the students, helping them decide what career they want, how to get there, and what Bay can do to get them there,” said Jessica LaMarch, director of admissions at Bay College. DCCAN hosts various programs to increase the percentage of students going to college in Michigan. It is a local branch of the Michigan College Access Network, which is working toward raising the percentage of students attending college in Michigan by the year 2025. Programs provided by DCCAN include 5th Grade Fridays, 8th Grade Career Exploration and Junior and Senior Career Fairs. The students were part of the first group of eighth grade students that attended the 5th Grade Friday program when it started in 2013. The 5th Grade Friday project exposes students to career options and helps to get them comfortable with college. The 8th Grade Career Exploration adds information from DSISD to the 5th Grade Friday Bay College agenda. “The 8th Grade Career Exploration shows students the choices they can make in high school to work toward a career. This project focuses more on careers and high school options than the 5th Grade Friday project,” said Kathy Becker, director of DCCAN. The students started their day at the DSISD with a brief introduction by Lisa Carley, career and technical education support at the DSISD, before breaking off into groups. Students experienced various presentations from instructors of welding, automotive, construction, machining, product design and development fabrication, personal computer technology, careers in education and health occupations. Each group was guided through classes by a high school student currently in the programs at the DSISD. The students were bused to Bay after touring the DSISD building, and after lunch they toured the college. Becker and LaMarch spoke to the eighth graders before breaking the students up into four groups. At Bay they went through six career sessions: business, communication, early childhood education, EMT-paramedic, nursing and science. The next 8th Grade Career Exploration will be Friday, March 1.